A seemingly abrupt shift in sentiment regarding monetary policy occurred during the last forecast period but certainly has implications for this one. Earlier this year, in the space of a few weeks, the Fed's posture shifted from one where it was projecting a couple of hikes in rates in 2019 to essentially forecasting none, while the process of running off its balance sheet went from being holdings being reduced on "autopilot" to something more "flexible". The reductions in bond and MBS holdings will likely come to a prescribed end by the time next year comes, and the Fed has even indicated a willingness to again start Large-Scale Asset Purchases (LSAPs) if lower interest rates alone can't goose the economy when needed. A globally slower patch for economic growth and still-tepid inflation has given the Fed a chance for "patience", but such patience will not last forever. The difficult stock market of the fourth quarter of 2018 and the effects of the month-long partial federal government shutdown are fading behind us but there has been some damping effect on growth in the first quarter of 2019. How persistent the effect of the shutdown is will dictate whether the Fed lifts rates this year or not; should the economy resume growing an above-trend pace after these effects fade, the Fed will be back "in play" at some point. Of late, the incoming data, largely still affected by the shutdown, has been mixed at best. The U.S. economy of course does not operate in a vacuum. Growth in China is slowing, with the official forecast for growth there lowered measurably; estimates for 2019 growth in the EuroZone have also been pulled down and the ECB has announced new stimulus measures and the delay of any interest rate increases. Growth in Germany stalled at the end of last year and has so far been weak to start this one; Japan's economy continues to struggle even with ongoing central bank support. The messy Brexit process remains unresolved, and uncertainties regarding trade and tariff policy persist. In such a climate, it's hard to expect a sudden surge in growth that might lift interest rates materially. A downturn in energy prices has served to temper inflation, but these effects will fade. The Fed's preferred measure of core inflation is still a little below levels they would like to see. At the same time, there seem to be enough firming cost inputs amid rising wages to suggest that at least steady inflation with perhaps an upward bias might be in place for a while. Overall, though, there are no consistent signs that inflation is gaining reliable traction anywhere, at least not enough to warrant concern. As is often the case, financial markets have also shifted focus. For a time last year, almost all news was good news... until the mood changed. For perhaps the last six months now, even good news seems to have been discounted. Investor sentiment went from optimism to pessimism quickly, tanking equity share prices and lopping the top off of interest rates. While it's to be expected that this perception by investors will again shift, influencing rates, the question is "When?" For a second straight forecast, our expectations turned out to be mostly (although not wholly) correct. Back in late December, we thought that the average offered rate for a 30-year FRM as reported by Freddie Mac would manage a range of 4.40% to 4.80%; for the nine-week period, the markets provided a 4.35% to 4.51% span, both a tighter gap and one that closed the period lower than anticipated. For hybrid 5/1 ARM, we thought initial rates would wander between 3.85% and 4.15%; 3.84% and 3.98% borders contained the most popular alternate to the 30-year FRM. 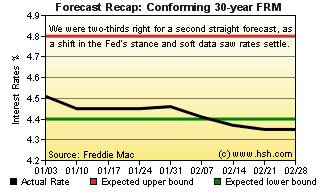 In both cases, rates tailed below out range bottoms as the forecast period came to a close. With the partial government shutdown still distorting the picture, it's hard to get a reckoning of how much the U.S. economy is being impacted by the nascent global slowness. Certainly, there is some effect; for example, the U.S. trade deficit just hit a new record, reflecting solid demand here but tepid growth elsewhere. However, to a real extent, this also shows the degree to which the U.S. is lifting the world's other economies, something that was commonplace in the early portion of the economic recovery. Now (as then) though, this remains a considerable weight, and the drag of other economies will tend to temper growth here to some degree. Still, there are reasons to be optimistic that growth may remain solid, even as the first quarter of 2019 will likely be well below par. Labor markets remain strong and wages are growing; in turn, this should prompt continued spending by consumers, powering the economy forward. There are some early signs that the housing market may add to (rather than detract from) growth as we move deeper in to the year, with increases in measures of pending home sales, improving new home sales and rising optimism among builders about their prospects. Manufacturing has decelerated from expansion highs but remains quite solid, and activity in the service sector, the largest component of the economy, has rebounded to robust levels after a soft couple of months. Measures of consumer moods have also turned up after a stock market-and-shutdown decline. Frankly, there's a lot to like, even if it is for now only guarded optimism. When will the incoming data be good enough to assuage investor concerns regarding weakness, who would then in turn begin to demand higher interest rates? What combination of growth and inflation will convince the Fed that another increase in the federal funds rate is warranted? It's hard to be sure, but we'll start to know if we see an uptick in long-term interest rates and changes in futures market expectations for Fed policy. As well, we'd also need to start to see bits and pieces of better news from abroad, such as better-than-expected or improving growth in China or Germany, a resolution to the Brexit situation, or even an ECB with a less-dour message about economic conditions in the Eurozone. Odds favor that most positive data will come from the U.S., but any from abroad would tend to brighten the outlook and underpin interest rates to some degree. While there are rarely periods of true balance, one might visualize a playground see-saw. For a time in 2017 and 2018, we had what was deemed to be "synchronized global growth", with most major economies moving to various points on one end of the bar. Mid-to-late last year, and a number moved more to the middle, and of late, to the other end of the bar. For the moment, the bad outweighs the good by at least a little bit, and as central banks have been known to say "risks appear to be to the downside" for the period just ahead. We are hoping for a bit more than that, something closer to "balanced risks", but we may not get there before this forecast period has come to a close. The forecast for the next nine weeks is both good news and bad news. The bad news is that the economic picture will likely remain murky and the data rather mixed, but we're optimistic that the overall tenor of it will be one of gentle improvement from a soft early 2019. The good news is that the lower interest rate climate of early 2019 should persist for a while, meaning that the lower mortgage rates in the market will likely remain through much (perhaps all) of the all-important spring homebuying season, something that would have been unexpected as recently as December. With soft inflation and a patient Fed as a backdrop, to which softer global growth can be added, we think that we need to lower expected ranges for interest rates a bit, but that a pretty flat pattern for mortgage rates lies ahead. 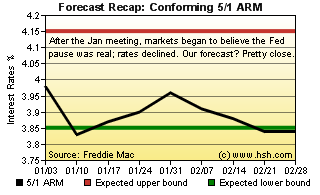 For the next nine-week period, we expect that the average rate for a conforming 30-year FRM as reported by Freddie Mac will manage a range of 4.20% to 4.55%; meanwhile, the initial rate for a conforming 5/1 Hybrid ARM will likely be contained by borders of 3.77% and 4.03%. This forecast expires on May 10, in the midst of the spring housing season. Whether buying, selling or just staying put, why not drop back and see how we fared? To follow mortgage rate movements and market influences on a more frequent basis, check out or subscribe to our weekly MarketTrends newsletter. Read the latest HSH Market Trends - and get it via email on Friday.